The University of Texas has a long history of offering courses in Czech language and literature. Two full-time lecturers continue that tradition providing students with up to four levels of instruction in Czech language and in the study of Czech literature and culture. UT also provides opportunities to work on research projects and travel to the Czech Republic. Examples of research projects include the Texas Czecy Legacy Project and the Prague Spring Archive. The Texas Czech Legacy Project translates archives of Texas Czechs telling stories of the history and culture of Czech immigrants as they settled in Texas and adapted to their new surroundings. The most recent project involves a collection of U.S. documents dealing with the political handling leading up to and during the crisis in Czechoslovakia in 1968. 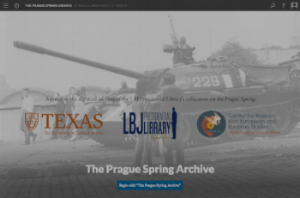 The Prague Spring Archive is a window in history to a key moment in US-Czech relations. There are a variety of other ways the experience at The University of Texas enriches our Czech heritage. Whether it is a field trip for students to museums or cultural centers in the state, or a weekly lunch meet up for students to practice their Czech language as offered by the Czech Mix club on campus, there is often something unique to do or see. One example of a special project was the filming of Homelands: West, Texas by the department. A touching story of the residents of West in the aftermath of the fertilizer plant explosion in April 2013. For more information about the offerings at The University of Texas, please check out the Course Offerings; Department Calendar of Events; and the Czech Studies Scholarship pages within the Department of Slavic and Eurasian Studies.